This week only, buy 2 pairs of shoes, get 1 pair free at BugalooKids.com! Note: it looks like a lot of the styles need to be pre-ordered and will not ship until late April. But when it averages out to $13 a pair, it's worth the wait! Source: Thanks to my Twittering pal Lexi. Check out her awesome blog. Live around Vancouver? If you missed this first sample sale a few weeks ago, you can catch it again: from Thursday April 2 to Saturday April 4, a sample sale on Fig Organic Kids, Turf Girl, Gaia, Stormtech, Twice Shy, and Breathe. Click here for the flyer here for more information. I love that you can earn Air Miles points online by first logging in to www.AirMilesShops.ca. I often shop at vendors where you can accumulate points: Toys/Babies R Us, eBay, Sears, Amazon.ca and Chapters.Indigo.ca. You can see the entire list of vendors on AirMilesShops.ca. I have often forgotten to first log in to AirMilesShops.ca. Well now there is a nifty toolbar that you can download and install so to help you automatically log in to your Air Miles account and track if you are on a website where you can log points! You'll also earn points by using the Yahoo! search bar that comes with the toolbar - 5 reward miles for every 50 searches! Babies R Us has Pampers diapers on sale at 20% off this week. Also they have free shipping on select AVENT bottles and accessories - so if you need some and don't want to get out of the house to buy them, this is a deal option! If you are buying online from Babies R Us, don't forget to sign in to AirMilesShops.ca to collect your points! Sears Canada online has started a "5 Days of Deals" event, beginning today! Today's deal is 20% off ALREADY REDUCED sale priced shoes for men, women, and kids. Brand names include Clarks and Hush Puppies! You have to enter 941612275 at checkout. Roots Canada notified me of a special deal through Twitter, which I'm passing on to you! Save 20% off regular priced items ONLINE ONLY until tomorrow, March 30 at noon EDT. Enter code TWITTER20! Check out Roots online at http:www.roots.ca ! Join millions of people around the world tonight by participating in EARTH HOUR, and turn off your lights for one hour at 8:30pm local time, no matter where you are in the world! Read more about how Earth Hour started, and its goal this year of 1 billion votes (participants) to present to world leaders at the Global Climate Change Conference in Copenhagen 2009. As I write this post, Earth Hour has already occurred in the participating cities of Chatham Islands in the Pacific Ocean, and in Beijing and Shanghai, China! Please also read this information about using beeswax candles versus paraffin candles during Earth Hour. GingerbreadMonkeys.com has a 10% off deal for Twitter followers, and I'm passing this deal on to you! Just enter discount code Tweet10 for 10% off all inventory! The code is valid through March 31, 2009, so catch this deal while you can. They offer a huge selection of unique baby gear, clothing, furniture, maternity wear, and more! While you are there, enter to win this cool Trunki Ride-On Suitcase! You can follow GingerbreadMonkeys on Twitter at www.Twitter.com/2moms1coolstore. Here's one more Pampers Gifts to Grow free point for you! Make sure you have all the free points you can get! Check my entire list of free Pampers codes here for a total of 12 free points! The deal-seekers at SmartCanucks.ca have put together a great list of Canadian coupons for products by Advil, Claritin, Imodium, Listerine, Motrin, Reactine, Rolaids, Triaminic and Tylenol! A lot of these coupons don't expire for quite a while yet (up to December 31, 2009). Click here to check it out! If there's any small item you've been wanting to buy from Avon Canada, today's the day (March 26, 2009) as they have FREE SHIPPING TODAY ONLY - use code MMFS. If you missed the free shipping deal, you can still get FREE SHIPPING on any AVON order of $35 or more at Avon.ca! Use code AVON35 at checkout. Avon has lots of deals on right now, like their 50% off Anew Force Duo for $28 and Naturals Duo Only $6.99 ($16 value). Check out their gifts for kids section and their Easter section while you are there! Save $2 off any Stayfree product! Coupon is valid until March 31, 2010, so remember to print this coupon each time you need to buy a Stayfree product! Melonhead in Vancouver has theme-park style chairs to make your baby's first haircut a fun experience! You can get 10% off baby's first haircut with this coupon here! Coupon is valid until May 30, 2009. Pampers coupons are back again at Save.ca! Regular users of Save.ca will know that Pampers coupons are not always available at Save.ca, so make sure you sign up for yours now! The coupons come in the mail in a few days. There are coupons for Swaddlers, Cruisers, EasyUps, Splashers, and a variety of wipes. You can only choose a maximum of 3 Pampers coupons. GollyGeezBaby.com is clearing out their stock! It shouldn't be hard with their 4o% off sale - applies to ALL merchandise! A wide range of products to choose from - clothing, feeding, toys, and more! It's Baby Days at Sears again! They have lots more stuff on sale! Check it out online or in-store! Baby Days end on April 3! Have a story read to your child by famous actors: James Earl Jones, Robert Guillaume, Pamela Reed, Al Gore, Jason Alexander, and other Screen Actors Guild (SAG) members! Storylineonline.net is an online streaming video program featuring SAG members reading children's books. There are 22 titles to choose from, and each story has an accompanying activity guide that you can download and print out, to enhance your child's learning. Dolly Parton launched a fantastic initiative which promotes reading for children called the Imagination Library. The initiative would provide for a brand new, age appropriate book each month to every child under 5 and mail it directly to their home. The Imagination Library is available in select Canadian locations. The newest location is the Yukon, and other Canadian locations include Edmonton (AB), Kelowna (BC), Merritt (BC), Dauphin (MB), St. John (NB), Acadia (NS), Deer Lake (ON), and many more. To find out if there is an Imagination Library initiative where you live, check with the Imagination Library website here. Read more about the Imagination Library and starting the program in your area. I'm hoping an organization will start this initiative in Vancouver! Here are a couple for those of you who love contests. Odds should better than winning a lottery ticket! Royale Reno-cations Contest - Win $13,000 towards a Home Renovation and then celebrate the changes you made, with a $7,000 Spa Vacation. You can improve your odds of winning by ENTERING WEEKLY and REFERING YOUR FRIENDS. You can receive one entry per week and up to TEN additional entries if you Refer your Friends and they enter the Reno-cation contest. Contest closes June 28, 2009. Fisher Price Little People 50th Birthday Contest - Win one of four grand prizes: a Bosman Home Front Play Set valued at $5,000; a $10,000 Transat Holidays vacation package to Orlando, Florida; a $15,000 Transat Holidays vacation package to discover the sites of Europe; or, an ultimate learning room packed with all the toys and tools your child could need, valued at $5,000. Contest closes on December 31, 2009. Want more contests? See my Contests and Giveaways post and in Contests in 2009. Want to try some instant cereal? Get a free sample of Nestle Carnation Breakfast Anytime. It's sample sale shopper paradise - so many sales! Astrosatchel, Sumiya, Audra Neil, Cul de Sac Design - children's wear, diaper bags, stuffed toys, vinyle purses and more, all made in Vancouver. Sale from March 20-21, 11am-6pm, at 339 Railway Street, #208, Vancouver. Wear Else Warehouse Sale - Tahari, Milly, Juicy, Tracy Reese, Velvet, Teenflo, Trina Turk, Michael Kors, and more! Sale is on now until March 21 at 28 West 7th Ave. (a few blocks west of Main), back door entrance. See the flyer here. Mexx, DKNY, Lucky Brand, Liz Claiborne - up to 80% off! Sale is on now until March 22, at 814 W. 6th Ave., 10am-7pm. Skyler Clothing - 50-90% off dresses, skirts, pants, tops and more. Leftover fabric also sold by the meter at discount prices. Sale is from March 21-22 at Heritage Hall, 3102 Main St., 10am-5pm. See the flyer here. Fidelity Denim - Outlet store is now open! Men and women's luxury denim, prices from $19.99-$99.99. Store location is #121-5589 Byrne Road, Burnaby. See the flyer here. Billabong and Von Zipper - Men, women, and girls' boardshorts, jeans, hoodies, and more! Cash only sale, one day only on March 20 from 10am-7pm at the GX Building #226-1868 Glen Drive, Vancouver, across from the Home Depot off Terminal Ave. See the flyer here. There are even more sample sales happening. For more, see the I Love Sample Sales website! Chapters.Indigo.ca still has a selection of toys on sale for up to 50% off! Only a few infant toys on sale, though. They also have select Hasbro games are 20% off until April 19. Milupa is currently offering a free sample of their baby cereal, and a free spoon! All you need to do is sign up on their website at Milupa.ca. While there, get some of their free downloads. There is a recipe booklet, nutritional checklist, feeding guide, colouring pictures. Milupa is based in Quebec, this freebie is only available to Canadian residents. Bugaloo is having a spring sale - select shoes are only $13.99 a pair! And if you buy 3 pairs, you get free shipping! Regular price on Bugaloo shoes is $19.99, which is lower priced than Robeez. Hurry, not many styles left! Check out the sale by clicking here! There's lots more on sale! Shop online or instore. See their website, you can view their flyer online. Get a free cookbook mailed to you! You can sign up for a free Gooseberry Patch Fall Favorites with Sunmaid Raisins and Dried Fruit cookbook from the Gooseberry Patch website. It's never too early to start exposing your baby to the alphabet and reading! Studies have shown that the earlier you begin reading to your child and exposing him or her to more vocabulary, the faster the child will learn when he or she eventually starts schooling. Starfall.com offers free online learn-to-read games and other learning activities. There are dozens of interactive learning activities to choose from, all very professionally done. I particularly like the ABCs interactive section, it is perfect for playing along with baby or toddlers! There is also a hand signing section! The site also has lots of fun stuff like building a gingerbread man. There is also a downloads section with lots more great learning printouts. Primarily designed for first grade, Starfall is also useful for pre-kindergarten, kindergarten and second grade, and perfect for homeschooling. This site is recognized and highly rated by The Reading Teacher named Starfall.com one of "Five Internet sites too good to miss" (May 2006). In 2005 and again in 2008, Homeschool.com recognized Starfall as one of their top five educational websites. I was as stiff as a board after baby. I was recovering from a C-section, so my abdominals were severely weakened. I had tendinitis in one wrist and arm, and also plantar fasciitis, which rendered me incapable of doing any high impact-related exercises. I felt physically totally broken. I started doing yoga once or twice a week at home. It helped me immensely in regaining strength and flexibility. If you were thinking of giving yoga a try, here's how I started out, and I also have a list of free yoga videos and podcasts below. The great thing about exercising at home is you can do it anytime and pause and come back to it if necessary. If you skip a week, or even two, don't feel guilty, just pop that DVD back in and get to it! I started with Crunch: Yoga Mama: Prenatal Yoga (which I had also used prenatally - it was reassuring to know that what I was doing was safe for baby). This video was a nice, gentle introduction for my body to gain back some flexibility. My next video was Bryan Kest's Power Yoga , which was MUCH more difficult (Bryan Kest and his group does some incredible super-human-looking poses). I was able to keep pace using the lower level poses. I noticed some major improvements with flexibility after using this video only two or three times. Beginners may find this video difficult to follow. Then I found Eoin Finn Yoga, which I picked up on sale for $9.99 at London Drugs, and it's become my staple yoga DVD - it's just the right pace and difficulty for now. With all exercise videos, it's best to watch the entire video once before trying to do the exercises, so that you will know what to expect. You should practice any exercises or yoga poses that are new to you before beginning the exercise video. Eoin Finn's website offers free podcasts for download. There are also 21 videos of yoga poses - these videos explain in detail about each pose, they are excellent for beginners! Check them out here. PrenatalYogaCenter.com has three pre/postnatal videos to help expectant or new moms target problem areas such as back pain and hip flexibility. Sportskool.com has 16 short yoga pose videos, including one Spanish prenatal (but there is no English one for some reason). YogaJournal.com has 118 yoga poses, with detailed information on the anatomical focus of the pose, benefits, therapeutic applications, how-to instructions, and more. Also on YogaJournal.com, 12 free episodes of The Yoga Practice Show, plus another 12 episodes from their archives (scroll to the bottom of their page). If you prefer the motivation of exercising with others, FREE YOGA CLASSES are held at Lululemon locations across Canada. The classes are usually held on Sunday. Check the locations near you for exact day and times. Get a free sample of Pledge multi surface cleaner! This freebie is through Save.ca, choose some other coupons while you are there! Note, you must use this link to have access to the Pledge coupon. Ladies, have you heard about reuseable menstrual pads? If you are wanting to go green, or if you have allergies to commercial brands, this is something to try. I haven't yet tried reuseables, but I am going to start with one of these deals. On Etsy, there are lots of hand-made reuseable pads for sale. They are made of colourful prints, so much more fun than a plain old disposable! Prices vary; I saw a listing as low as 2 for US $7 + shipping. The shipping is usually priced reasonably, even shipping from the US (average around $4). Click here to view all the reuseable pads on Etsy. Cloth pads are easy to care for. There are a few methods, but I think the easiest, by far, is after use you simply rinse them out and store until laundry day. To launder them, throw them in the wash with any load you're already doing. That's it! Or, if you're cloth diapering, you can throw your pads in with them. That's a general guideline, but that routine can vary a little if you buy special pads (pads topped with silk, or pads backed with wool, for example, which need a gentler cleaning). Matersum has a free shipping deal for Canadians right now, so now's a good time to try out a reusable pad! Visit her blog here, too. Vancouver-based Lunapads offers a wide selection of reuseable pads, also in a variety of wonderful colours and patterns. They have pads, liners, pantyliners, mini-liners, liners with or without wings, post-partum liners, organic pads, multi-packs and more! To celebrate International Women's Day, they are having a 20% off sale until March 9, 3pm! You can view prices in either Canadian or US dollars. Shipping costs vary. The sale is online at www.lunapads.com. I'd love to hear about your experience with reuseable pads! Leave me a comment below! Crocodile Baby in Vancouver is celebrating their 10th anniversary with a 10% back sale! For every purchase made in-store at Crocodile Baby until March 15, customers will receive a voucher worth 10% of the value of their purchase (before tax). For example, buy $199.00 of stuff, get a $19.99 voucher back! These kind of deals are great for buying items that rarely or never go on sale, or if you need to buy a big-ticket item. This sale is only good for in-store purchases, and the vouchers are only valid in-store from March 16 to May 31, 2009. There are some exceptions, check out their website, CrocodileBaby.com, for more details. Plan on visiting Vancouver? Or do you have family or friends visiting soon? Book a two-night stay at a participating hotel, and get a bonus $100 Cadillac Fairview gift card that can be used at over 100 stores! You can book online or by phone at 1-877-826-1717. Choose from 25 different hotels. Rates from $88 a night! Click here to view the hotels and complete offer from Tourism Vancouver. This promotion runs until March 31, 2009. Purex is promoting their 2X Ultra Concentrate again! Get your free sample at http://www.freesample-purex.ca/. Online store Baby Planet Boutique is still having a pretty good sale on, with lots of sale items to browse through. 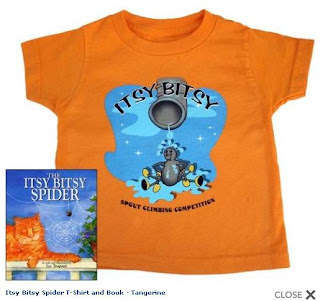 One of the items that caught my eye were these cute little T-shirt/book sets, on sale now at 50% off for $13.50. There's Itsy Bitsy Spider, Wheels on the Bus, Humpty Dumpty, and Hey Diddle Diddle. You can also use coupon code MAR09NEWS to receive 10% off of your next order! The store also offers a multiples babies discount on a regular basis, if you are shopping for twins, triplets, or more. Use coupon code MULTIPLES at checkout to receive a 10% discount! You must purchase at least 2 of the same product (products can be different colors/patterns) for this coupon to apply. Shipping costs start at $5.95. Click here to see their shipping rates. Jack and Lola has put together 4 more sleep sessions to be held in March! You MUST email info@jackandlola.ca to register, as space is limited to 25 people per session. Email the age of your child and how many adults will attend, and they will confirm your space. SESSION #1: Monday March 23rd @ 6:30 p.m. for parents with Infants 3-5 months only. How to assist your baby in going off to sleep without using "sleep crutches" or "sleep associations"
Contact Jack & Lola for more information. Costco.ca has a sale on baby items! The prices INCLUDE SHIPPING - save yourself the gas money and the trouble of lugging some of the bigger items home! Click here to see all the Costco.ca baby stuff. Here's a couple of Motrin coupons for discounts off their new rub or patch products. Save $1.00 on Motrin Active Pain Relief Rub, or $1.50 on Motrin Active Pain Relief Patches. The coupons expire May 31, 2009. Click here to get your Motrin coupons from Motrin.ca. OQOQO on West 4th Avenue in Vancouver is offering free belly dancing classes each Tuesday during March! A fun way to get in some exercise. idance Belly Dancing Classes Tuesday Nights in March! SIGN UP REQUIRED. You can sign up in the store, or email oqoqow4th-store@lululemon.com. One of my favourite sites, Tipnut.com, has listed 44 - yes, that's fourty-four - projects for baby! If you are a crafty sort, you'll love this list. There are free patterns and tutorials for baby, such as cloth diaper patterns, burp cloths, baby wipes, baby blankets, diaper bags, and booties. Check out the list from Tipnut.com here.